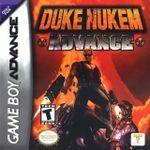 "Duke Nukem Advance is a portable video game in the Duke Nukem series. Although it is a first-person shooter and many of the graphics and sounds have been ported from Duke Nukem 3D, the game has an original storyline and levels. Four difficulty levels can be selected at the beginning of the game. Multiplayer games are possible, with up to four players requiring a copy. An option to save ones progress appears at the completion of each level, with five save game slots to choose from." Source: Wikipedia, "Duke Nukem Advance", available under the CC-BY-SA License.